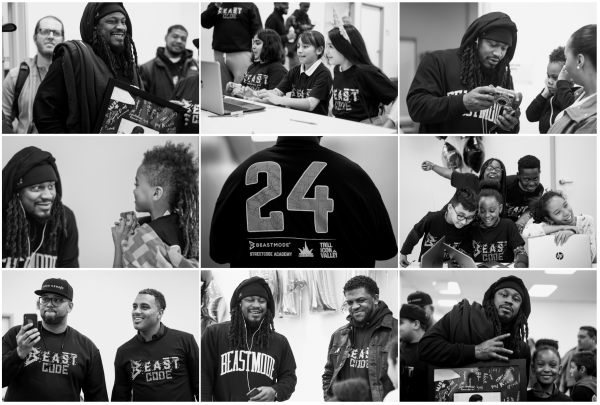 Marshawn Lynch Hosted a BeastCode Event « Adafruit Industries – Makers, hackers, artists, designers and engineers! For those of you who don’t know, Beast Mode runs a non-profit for the empowerment and education of underprivileged youth. He is not only one of my favorite running back but he is one of my favorite socially active players. This limiting and toxic viewpoint is why Marshawn Lynch’s support of StreetCode Academy is so relevant. Marshawn is more than a legendary athlete, he is an entrepreneur, philanthropist, and advocate for empowering and educating our youth. On Monday, Feb. 26, BeastMode himself, made a surprise visit to StreetCode, an EPA-based organization that provides free classes in technology. He received a rock-star welcome as he engaged with students building iOS and blockchain applications, electronic speakers, and more. Check out what he did.